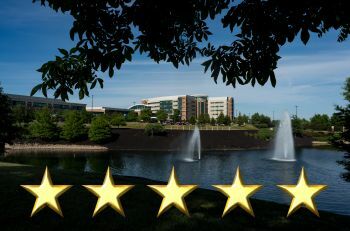 Reid Health was one of 293 hospitals in the United States and only 13 in Indiana to receive a five-star rating from the Centers for Medicare & Medicaid Services (CMS) in a recent release of data. CMS released its Overall Hospital Quality Star Ratings in February, reporting on measures from more than 4,500 hospitals. Star ratings range from one to five, with the majority falling in the three- and four-star range. Jessica Austerman, Director of Quality & Patient Safety for Reid Health, said the rating process is complex, with some measures carrying more weight than others. The ratings are based on seven areas – mortality, readmission, safety of care, patient experience, efficient use of medical imaging, timeliness of care, and effectiveness of care. Each area has numerous indicators included and scored. According to CMS, the four measures with the most weight are mortality, safety, readmission and patient experience. Jennifer Bales, M.D., Chief of Reid’s Medical Staff, said clinicians, nurses and support staff work together as a team on behalf of patients. “Our goal is always excellence, from routine visits with patients in the office to urgent or emergency care,” she said. The Star Rating was launched in July 2016 as a way to summarize quality information in a consumer-friendly format. The measures are reported and explained on Hospital Compare on the CMS web site. Originally the ratings were to be released twice each year, but planned releases in July and December were postponed until recently. It is not clear when ratings will be announced again.